Yesterday the girls and I went down to check out the Albany Institute of History & Art. We’d been there multiple times before, of course–I even worked there briefly–but it had been a while. With our Hamilton obsession, we all wanted to check out the Spotlight: Alexander Hamilton exhibit, and I figured that the girls had likely forgotten the stuff they’d seen on permanent exhibit, anyway. But, really, it was the temporary exhibitions that got all the glory. The girls had fun trying to choose which chairs they’d put in their future fantasy homes in the Art of Seating exhibit, but far-and-away their favorite part was checking out the super-clever Look-Alike dioramas, where lollipops and shoehorns and matchsticks were meticulously put together to construct landscapes, domestic scenes, and more. Meanwhile I loved wandering around the Rock & Roll Icons exhibition . . . that is, until I paused between some photographs of Bruce Springsteen and an image of Madonna, and it occurred to me that, at some point, they’re going to die, too. I mean, of course I’ve always known this on some level, but now it took on the feeling of of me participating in a horror movie where they’re just racking up a huge body count and I’m wondering, is anyone going to manage to get out of this house/forest/summer camp/amusement park? I don’t really watch a lot of horror movies, so I’m not actually aware of a horror movie that takes place at an amusement park, but it seems like an excellent and potentially terrifying setting. Huh. I just wrote that, and then I had to Google it, and lo and behold, there’s an article on 16 Movies That Will Make You Rethink Going to An Amusement Park. Thanks, internet! Love ya! But I digress. The point is, there’s a distinct air of doom lately. I don’t think I’m the only one who feels like Eeyore under the rain cloud or Pigpen in his swirling cloud of dirt, and, you guys? We’ve got to shake that. Also, in 2016’s defense I would like to point out that 2001 was also a tremendous crap year, and some really lovely people died then, too. Anyway, the girls had had about as much culture as they could stand and I needed to flee reminders of encroaching mortality, so we left to pick up Cute W at his office next door and we all headed out to lunch at La Empanada Lllama. 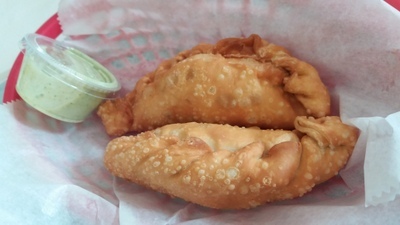 We have been fans of La Empanada Lllama‘s empanadas at the Schenectady Greenmarket for a long time, so when Cute W saw that they were running a Groupon, he scooped some up immediately. Our standard family favorite is the chicken empanadas. Here you see two of them, nestled lovingly together, with a side of green sauce, which is absolutely delicious and tastes a bit like a compromise between those two green sauces I made for school last year when I told J that I wasn’t up for making 70 empanadas. In fact, these are the empanadas that inspired J’s request, but I knew that I would never measure up to these little beauties. 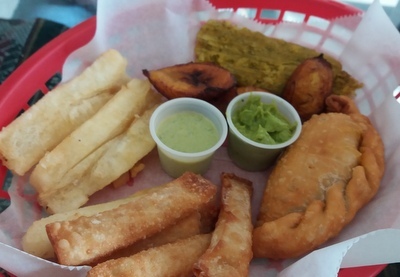 For variety, we also ordered beef empanadas and Mexican empanadas, which contain beef, refried beans, and guacamole. We liked it all, but the Mexican empanadas were new hit. We did not order the spinach and cheese empanadas, because I am the only person enthusiastic about them. I kept trying to sell the family on them, but when no one was interested, I surrendered, because I am The Mom and because they’re usually at the farmers’ market, anyway. However, this turned out to be a mistake, because as much as I loved the rest of the meal, I couldn’t help mourning the loss of the spectacular spinach-and-cheese-empanada eating opporunity that I’d missed, and I whined about it slightly too much. Lesson learned: always order more. Speaking of ordering more, we are always, always, a fan of the variety appetizer platter at any restaurant. An easy way to dabble in a little bit of everything. In this platter, we got (clockwise from top): a tamale, fried plaintains, an empanada, tequenos (fried cheese), and fried yucca. Besides the empanada (of course) the tequenos were probably the favorite, followed by the fried yucca. The tamale lost the popularity contest, and J said that she liked the plantains that we’d fried more (I’d gone for twice-fried to crispiness, while these were soft and sweet). We skipped out on rice and beans or other sides because, well, they’re kind of boring. Obviously you can’t eat a big ol’ plate of fried everything daily, but since it was our first trip and we’re unlikely to schlep to Albany too often, we focused on maximum deliciousness. Poor Cute W had to go back to work, but the girls had more fun in store. J headed to Empire State Plaza to ice skate with her bff, and M and I headed to the mall to burn through some of her gift cards. An excellent vacation day. This post made me hungry. But may I also suggest that a cultural/historical activity that will be a “feel good” as we head into the new year is to take the girls to see the movie “Hidden Figures?” It is great – lessons learned about NASA, historical racism and the outstanding courage but best of all, it celebrates smart women in science and math. Hurry before it isn’t in theatres anymore. It’s on our list for this weekend. I wanted to go last weekend, but we couldn’t fit it in. I’m excited to go.